This is what your teeth look like and what they are called. The teeth near the front of the mouth that come to a single point. Sometimes called the "eye teeth " or "canines. " Canine means "of or like a dog "
The teeth with two rounded points located between the cuspids and the molars. See if you remember the names of the teeth. Drag the names of the teeth to the correct boxes. This is what a molar looks like. is a hard, shiny substance that works as a barrier to guard the inside parts of the tooth. 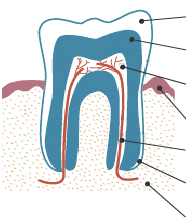 dentin makes up the largest part of the tooth. Dentin is like bone and is almost as hard as enamel. pulp is where each tooth's nerve endings are. See if you remember what's inside a molar. Drag the words to the correct boxes. Caries: Tooth decay, which leads to a cavity. 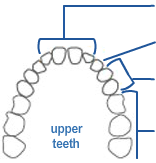 Orthodontics: Straightening or moving misaligned teeth and/or jaws, usually with braces. Pediatric dentist/pedodontist: A dentist who treats children from birth through the teen years. Plaque: A bacteria-containing substance that collects on your teeth. Get rid of plaque by brushing and flossing every day. Retainer: A device used to stabilize teeth after orthodontic treatment is complete. Sealant: A thin plastic material used to cover the biting surface of teeth to prevent tooth decay.